My wife knows what to get me for my birthday. 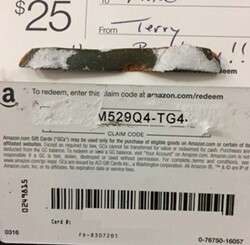 This year Terry gave me an Amazon gift card for my birthday back in August. That always works. But when I went to redeem the gift card several weeks later I ran into problems. I pulled up the tape to get the redeem code and half of the redeem code came up with the tape. That doesn’t work. I submitted a support request to Amazon. They responded saying that they couldn’t find the gift card and to please submit an image of the card. I submitted what you see here. They responded saying that they had updated my account with the gift card balance. And indeed they had. Thank you, Amazon. All’s well that ends well.